Gupt Navratri, also referred as Gayatri or Ashada Navratri, is nine days dedicated to the nine forms of Shakti (Mother Goddess) in the Hindi month of Ashada (June – July). Gupt Navaratri is observed during the Ashada Shukla Paksha (waxing phase of moon). In 2019, Gupt Navratri begins on July 3 and ends on July 10. 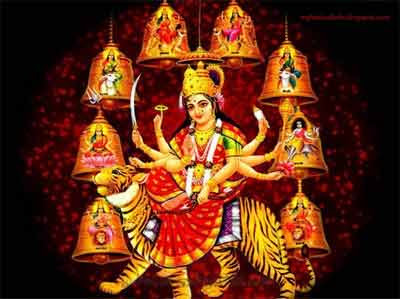 Gupt Navratri rituals are followed mainly in the Hindi speaking states in India. It is largely observed by women in Madhya Pradesh and Uttar Pradesh. The nine days are dedicated to worship of various forms of Shakti. This Navartri is particularly important for all Upasakas or worshippers of Varahi. Varahi is one of the seven Matrikas of Devi Mahatmya. It is also referred as Guhya Navratri in Himachal Pradesh. Some people fast on certain days of Gupt Navratri and vegetarian food is consumed during the period. The most important event during the nine-day period is community worship of the nine forms of Durga or Shakti. Women in a locality gather in a household during evening and worship Mother Goddess. Gupt Navratri is also observed during the Hindi month Shukla Paksha of Magh (January – February). As per certain belief, this nine-day period is also dedicated to Dasa Mahavidyas - the ten Mother Goddesses. How to perform Gupt Navratri? Regular puja is to be performed on all days to Mother Goddess in a designated area. Avoid non-vegetarian food. Do not drink or smoke. Ghatasthapana or growing of wheat or barley is not required but if you wish to do then you can. Goddess Varahi form of Mother Goddess is given important in majority of the regions. Take bath daily in the morning. Perform simple puja in the morning and evening daily. There is no need for complicated rituals and pujas. If possible provide food to poor and hungry. Giving food to animals increases virtue. A devotee should perform puja and worship of Mother Goddess by sitting on a red color cloth. Those looking to attain siddhi and moksha should sit on seating made of Kusha or Durva grass. The lamp made of gold, silver or gunmetal should be used for pujas and prayers. Lamp should be lit using cow ghee. A single wick should be lit. If you are performing an important puja with all rituals then nine wicks should be lit. Prayers and mantra should be chanted using mala having beads of red sandalwood or rudraksha. A simple bhog like khicadi etc should be made and offered. It should be taken back after puja and shared with family members and neighbors. Even offering a small piece of fruit is enough – you do not need to do elaborate cooking. Shakti upasana or worship of Mother Goddess during the period will help in regular flow of grains and wealth into the home. Those interested politics and power will have desires fulfilled. It is performed to get the blessings of mother goddess and for auspiciousness in life. It is believed that the sadhana performed during the period will be rewarded and it will never be unfruitful. Prayers and pujas are performed during the period to overcome evil eye, witch hunting, black magic and other similar superstitious beliefs. Prayers are also performed during the period to overcome illness and to change bad luck. Rishi Shrungi was once giving advice to devotees under a peepal tree. A woman from the crowd got up and told the Rishi that he was not able to get the blessing of Maa Durga because of the bad activities of her husband. Her husband was indulging in all kinds of immoral activities and forcing her to participate in them. Due to this reason, the woman was unable to perform any kind of vrat, puja or rituals. She wanted to take refuge in the feet of Goddess Durga but was unable to do because of the activities of her husband. She asked Rishi Shrungi to help her in finding the blessings of Maa Durga. Rishi Shrungi then told the woman that all people know about the Chaitra (March – April) and Sharad (September – October) Navratri. But apart from there are two secret Navratri in a year during which the 10 Mahavidya (Dasa Mahavidya) form of Mother Goddess is invoked. Rishi Shrungi asked the woman to perform the Gupt Navratri to get her blessings. The woman performed intense penance during Gupt Navratri and because of which the woman achieved peace and prosperity. Her husband abandoned his wanton life and became a responsible family man. All this happened due to the blessings of Maa Durga worship during Gupt Navratri. A person doing Sadhana and puja during Gupt Navratri should follow certain rules. Here are the dos and don’ts during Ashad Navratri based on oral tradition followed in many regions. The devotee performing puja and vrat during Gupt Navratri should not wear or use any items made using leather. Anger, jealousy, lust and desire should be completely avoided. Hair should not be cut during the period. Nails should not be cut during the period. Mundan Sanskar should not be performed. It is better if family members avoid cutting hair during the period. Black color clothes should not be worn during the period. Devotee should not sleep during daytime. Small children, pregnant women, old people and those who have been diagnosed with serious illness should not perform the vrat strictly. Performing puja of young girls during the period is meritorious. Reading Durga Saptashati or Durga Saptashloki on all the day is beneficial.